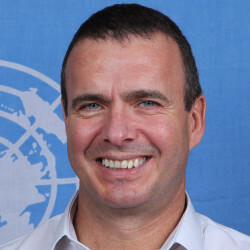 Jaco Cilliers is the country director of UNDP in India. Prior to that, he was the deputy resident representative for UNDP in Uzbekistan where he was responsible for the management and coordination of programme and operations. He also worked with UNDP Cyprus as senior programme manager and head of office. Before joining the United Nations, Cilliers worked as deputy regional director for Southern and Central Africa for an international NGO and in senior advisory and management positions for development organizations in various parts of the world. He has significant experience of working in development and conflict areas.